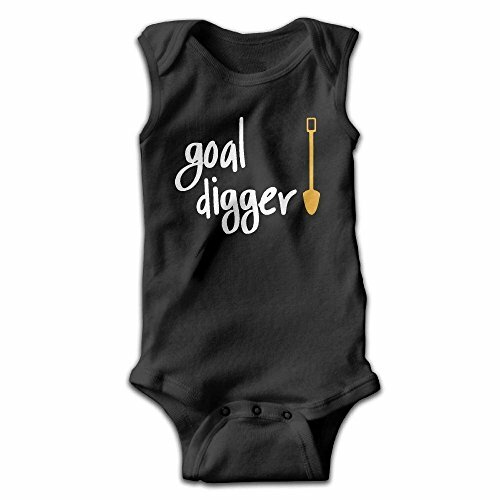 Goal Digger Onesie Romper Jumpsuit.Our Unisex One Piece Baby Bodysuit Make Great Gift For Newborns,babies,infants,baby Showers And Expectant Moms.Perfect For Summer Wear,also Can Wear In Autumn And Spring. You Can Quickly Open The Button Part When You Need Changing The Nappies For Your Baby. 0-3Months : Bust - 21cm/8.26", Length - 40.5cm/15.94"
6 Months : Bust - 22cm/8.66", Length - 42.5cm/16.73"
12 Months : Bust - 23cm/9.05", Length - 45.5cm/17.91"
18 Months : Bust - 24cm/9.44", Length - 48.5cm/19.09"
24 Months : Bust - 25cm/9.84", Length - 51.5cm/20.27".